Earlier this morning, China time, the fine folks at Shanda Games dropped a bombshell. They're bringing Borderlands to China. That's right, they've announced Borderlands Online, a made for China action RPG/online shooter. 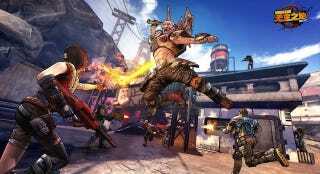 According the press release sent out by Shanda and republished by various Chinese press, Borderlands Online will be both a PC game and a mobile game! Not much is known about the story and how it'll all tie into the Borderlands universe, but the game is set for launch sometime in 2015. Shanda is working as both the operator and publisher of the game, developing alongside 2K games and Gearbox. 2K games has set up a dedicated development and support team for this game in Shanghai. Players will be able to play as four distinct character classes that are similar to the characters found in the original Borderlands. The characters available are the soldier, hunter, siren, and what looks to be the berserker. It's interesting to note that big name western titles slated for online versions in China have yet to make a full on public debut. Games such as Call of Duty Online and Monster Hunter Online are still in "closed" phases of beta where the average player needs to attain a code before they can play. Keep in mind that these games are free—Borderlands Online is also expected to be free to play in China.